There will be a slew of great Jewish musicians hitting stages all over SXSW this year. Just check out Kosha Dillz opening up for NAS or the official showcase with SoCalled and Diwon’s soul/rock/hiphop group, Dreams in Static. 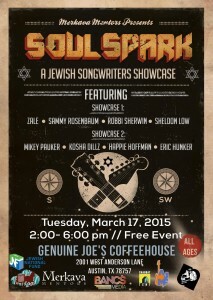 However, one especially Jewish selection this year is ‘Soul Spark,’ A Jewish Songwriters Showcase. Soul Spark will be building sacred pluralistic space in the heart of Austin at Genuine Joe’s Coffee Shop during South By Southwest Music Festival while bringing together the Austin Jewish community for an afternoon of inspirational music,food and friends. SXSW music festival is an environment where creatives can come together and share ground breaking art and expression through music, social media and film. SoulSpark is holding space for the Jewish community to celebrate the diversity of contemporary Jewish music. And check out www.bancsmedia.com/sxsw for some other interesting showcases that will also feature Mikey Pauker, Kosha Dillz and Dreams in Static.